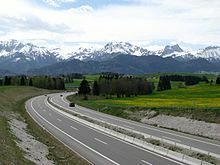 Many countries have national networks of controlled-access highways, the names of which vary from one country to another e.g. 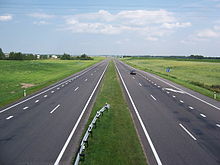 freeway or motorway. The networks do not always include all such highways, or even all the major ones in the country. The Jinghue Expressway, connecting Beijing and Shanghai in the People's Republic of China. Motorway 5, connecting Tehran and Bandar Imam in Iran. Motorway 4, running between Istanbul and Ankara in Turkey. Bundesautobahn 7 near Füssen, in Southern Bavaria, Germany. Motorway A1 crossing Serbia, connecting the border to Hungary in the north, with the city of Niš to the south. The tract connecting to the border with North Macedonia is currently under construction. 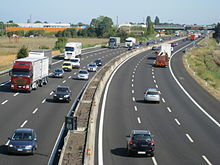 The Autostrada Adriatica runs through the eastern coast of Italy, linking Bologna to Taranto. The Mexican Federal Highway 95 passing close to the city of Chilpancingo, in Southern Mexico. 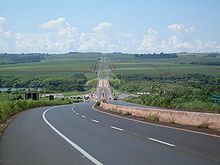 The motorway BR-101 connects Rio de Janeiro and Belo Horizonte in Brazil. Route Nationale 1 through a viaduct in northern Réunion.